Yesterday, much of the country came together in awe to witness a cosmic phenomenon. Today, we can come together once more and bask in the most glorious small-truck news in recent memory: the Hyundai Santa Cruz is for sure coming to the U.S. market! Michael J. O’Brien, vice president of corporate and product planning at Hyundai’s U.S. unit, told Reuters that Hyundai’s top management has given the green light for development of a pickup similar to a show vehicle called the Santa Cruz that U.S. Hyundai executives unveiled in 2015. We first laid eyes on the Santa Cruz small pickup concept at the 2015 Detroit Auto Show and immediately fell in love with it. It was the small, versatile people- and stuff-carrier of our wildest dreams. Later, in the summer of that year, we learned that the concept was on the verge of getting the green light by Hyundai higher-ups because of the overwhelming positive feedback from the show. And! Now! It’s! Actually! Happening! Right now, if you want a truck, but have no use for behemoths like the Ford F-150 or the Ram 1500, your options are pretty limited. Even the Honda Ridgeline and the Toyota Tacoma are a little too much. What then? The Hyundai Santa Cruz would slot in right beneath those mid-sized trucks. It won’t have a massive bed or mountain-moving towing capacity. But it will be sized favorably for folks living in more urban areas who want something to go adventuring with on the weekends. 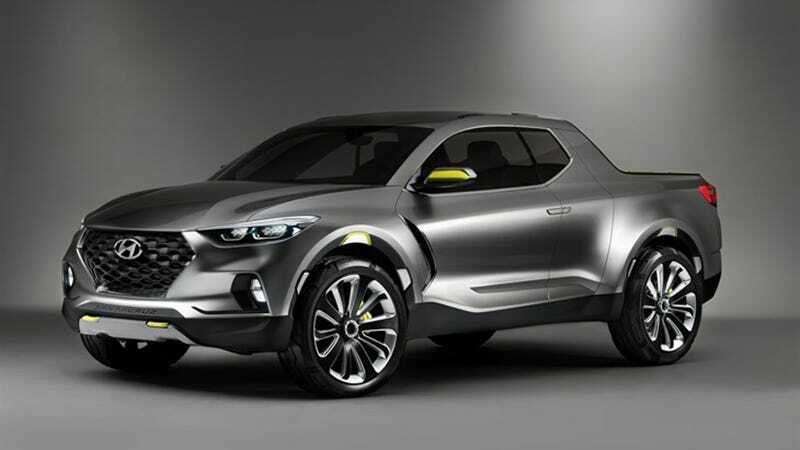 The Santa Cruz will likely ride on the Hyundai Tucson’s platform. What kind of engines will be fitted to it is unclear. We have reached out to Hyundai for further comment and will update if we hear back.